Geneva Ramone is a Navajo silversmith whose work we added to the Chacodog Collection as of June 2013. 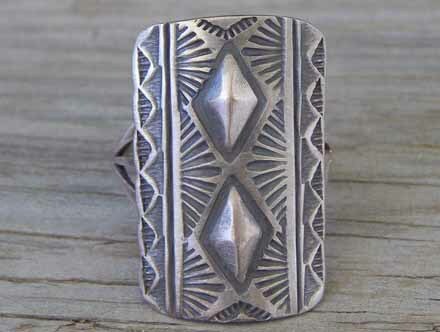 She specializes in smithing traditional Navajo jewelry, often referred to as Traditional Revival jewelry. This ring's rectangular concha with soft corners is stamped and shows "bumped up" decorative motifs. Geneva used steel wool to get a brushed finish on the silver before using an oxidizing agent to darken the Sterling and lend it an "old pawn" finish. Hallmarked "G. Ramone" and stamped "Sterling". Dimensions of concha: 1 3/16" x 13/16"